How many letters written 121 years ago resonate today? Drama in the Hood suspects very few. But, there is much more to this story than a little girl’s postal query and a newspaperman’s answer. In the case of “Yes, Virginia there is a Santa Claus, so much of what makes up the holiday is included. Childlike curiosity and hope, just as in “The Night Before Christmas.” Cynicism and doubt, just as in “There’s a Wonderful Life.” Renewal and restoration, as in “A Christmas Carol,” “The Miracle on 34th Street”, and on and on. Indeed, one might say, “Yes, Virginia” inhabits the season as well as any other Christmas standard. 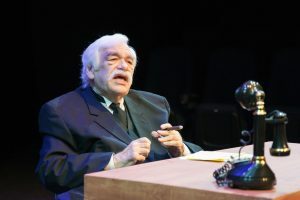 Lakewood Playhouse opened the play Friday night, and the season could not have gotten off to a more appropriate beginning. Everyone knows the basics. Young Virginia is taunted by her more-worldly friends that Santa Claus is not real. She goes to her father who turns the question into a research project. Virginia writes the letter, more or less on her own (scholars question whether she had help as few children call their chums “little friends.”), and receives an answer written in the kind of prose that makes writers want to throw their keyboards away and wash dishes for a living. Indeed, Frank Church, half in his cups, is a better wordsmith than the rest of us stone cold sober. Therein lies the beauty of this story. It’s about a child, but it isn’t. The story is about a cynical widower at odds with the world, but it isn’t. It’s about a family struggling, except it isn’t. “Yes, Virginia” is about the human experience in hard times. Indeed, one might say it is about long ago, and fifty years ago…and today. Story narrator/New York Sun publisher Edward P. Mitchell guides the audience through myriad scene changes and keeps the story in context. Played exquisitely by Tom Birkeland, the role is the anchor piece for what happens on stage. Director Aaron Mohs-Hale hit a home run with Mr. Birkeland, who has never been better than he is in this outing. Wryly humorous at times, and sternly sober in others Birkeland drifts back and forth from narrator to publisher with seamless grace. As Mitchell, his care for an employee in a bad way shows through a gruff exterior. As show guide, Mr. Birkeland is just what Mohs-Hale asked for in this spot. The employee in a bad way is Frank Church. Hardened by the war and having been widowed by his 28-year-old wife and young child’s untimely passing, Church was wasting his talent in dissipation and depression. That is until something in Virginia’s letter awakened the light of human kindness within. Parker Dean hits all the right notes in his portrayal of Church. One can see George Bailey and Ebenezer Scrooge in Frank Church. Parker Dean’s virtuoso performance brought them all to the fore. The role of James O’Hanlon is played by Edward Medina. The O’Hanlon’s were first-generation immigrants from Ireland and were treated about as badly as first-generation immigrants have always been treated. Maybe no one wanted to build a wall against them, but jobs and respect were hard to come by if you were “a Mick” entering the 20th Century. Medina is great in the part. O’Hanlon was a hard worker with a fierce pride in taking care of his family. The earnestness Mr. Medina puts forth is genuine and realistic, resulting in a very nice job. Kayla Crawford plays O’Hanlon’s wife and Virginia’s Mom. A critical favorite in this town, Ms. Crawford plays her role with subtle moves and gestures that show her ownership of the part. It is a joy to watch Kayla Crawford work, and she puts forth a tremendous effort as Evie O’Hanlon. Ah, what to say about young Norah Francis Gawryczik in the role of Virginia? In this, her initial main stage outing, she is precious to the core! Her stage manner and hand movements when asking Dad the big question are beautiful to watch. They are as if to say, “C’mon, Dad! This is IMPORTANT!” The sound engineers must make sure Norah is loud enough because she will take it from there. She’s an actress! 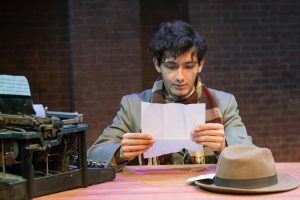 The ensemble cast is uniformly excellent, and the spare scenic design is perfect for the time and place where this play is set. Once again, Virginia Yanoff’s costumes are spot on. She’s in her element in a period play. There is a song that says, in part, we need a little Christmas, right this very minute. Those lyrics may have never been more accurate than 2018 in these United States. When Lakewood Playhouse chose this play, they may have tapped into the very wellspring of that emotion. Support the arts this Holiday season, while supporting LPH in its mission to entertain, educate, and make its city a place to live. Besides, you need a little Christmas.